Looking for a lighter option for your Sunday brunch with friends? 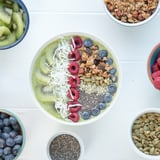 Whip up this colorful and tasty green goddess smoothie bowl, topped with all the flavors you love. Watch the video above to see how it's done, and check out the recipe below. Sometimes brunch calls for a new favorite. We partnered with DOLE® Fruit & Veggie Blends to bring you this easy smoothie bowl recipe. The recipe works just as well with other milks for those who are allergic to almond milk or nuts. Pulse until thick and creamy (scrape down the sides occasionally if need be). Pour into a bowl and decorate with toppings of your choice. Feel free to get creative.